In order to trade different financial instruments, you need a trading platform to analyze the markets, make decisions and instruct the broker to execute your trades. 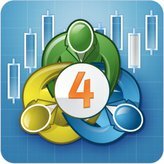 Metatrader 4 (MT4) is the most popular trading platform among retail traders. It is simple enough for beginners to start trading with MT4, as their first platform, but its advanced funcionalities (such as dozens of built-in indicators, graphical tools, the ability to run trading robots, EAs) make it perfect for intermediate or even advanced traders. Click 'Enrol' and learn how to use Metatrader 4 now!